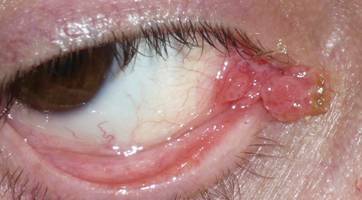 They are newly formed injuries that along with the eyelids are the most frequent eye location. 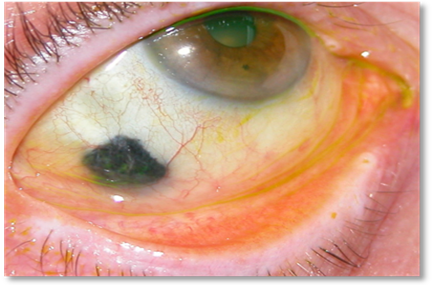 They cover a wide range of benign and malignant lesions from papilloma to melanoma and may even jeopardize both visual function and the patient's life. Benign tumors are more common than malignant ones. - Spitz: benign pigmented tumors. 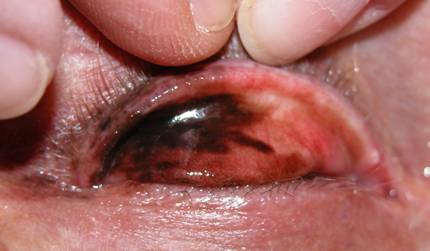 The nevus (freckle) is the most common pigmented lesion. - Melanoma is a rare tumor that be lethal. 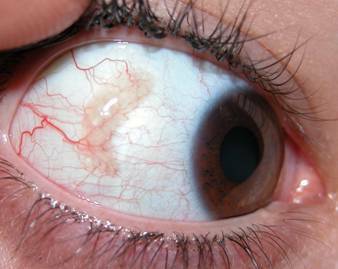 - Lymphangiectasia: dilated lymphatic vessels of the conjunctiva which are very common. They are benign. Treatment consists of surgical removal, but they may recur. - Caruncular cysts: The caruncle is between the two puncta and is the original site of the injury. - Pyogenic granuloma: lesions are pedunculated, papillomatous, pink. Treatment is surgical removal. 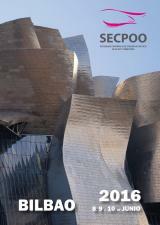 - Intraepithelial carcinoma: precancerous lesion and the most common within malignant types. It presents as sometimes whitish lesions that grow near the limbus. They should be removed completely. 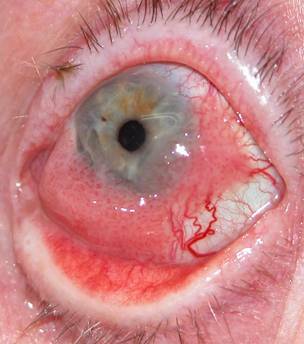 - Lymphoma: accounts for 30% of lymphomas of the eye. 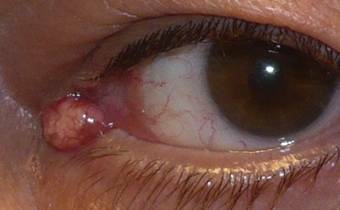 Most are only located in the conjunctiva and treatment is surgical removal and sometimes radiotherapy. In cases of metastasis patients should undergo chemotherapy. It is not known exactly what causes these tumors. Its origin is multifactorial. Hereditary or intervening causes exposure to harmful agents. 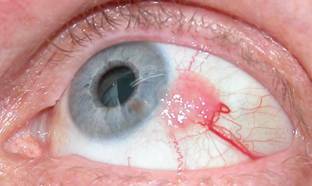 The main symptoms are the presence of a lesion or stain that grows or changes color. 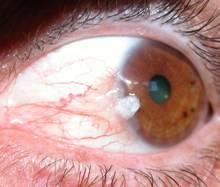 They may have vessels and produce eye redness and tearing. Less rarely they cause pain. The aim is to destroy the tumour without damaging the surrounding tissues and therefore early diagnosis is crucial. Patients should promptly see a specialist the moment they notice any lesion, no matter how insignificant it may seem. Benign lesions typically grow without destroying the tissues. 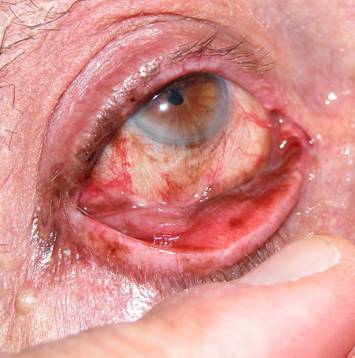 Treatment is by simple excision (removal) and complete closure of the conjunctiva. We always send the sample to a pathologist for confirmation as conjunctival benign and malignant tumors are difficult to differentiate by appearance or symptoms. In cases of suspected malignancy we perform complete excision and enlarged rim and apply a security barrier cryotherapy (using a freezing terminal) to minimize the possibility of recurrence. Some tumours are treated pharmacologically with mitomycin, interferon or fluorouracil. 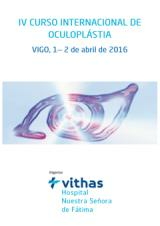 Radiotherapy is used as adjunctive therapy in some tumors such as lymphomas. Most of these surgeries are performed on an outpatient basis and require monitoring for months or years to prevent recurrences. Overall the prognosis of these tumours is good, except for some, such as melanomas, in which the degree of extension is very important indicator of prognosis.